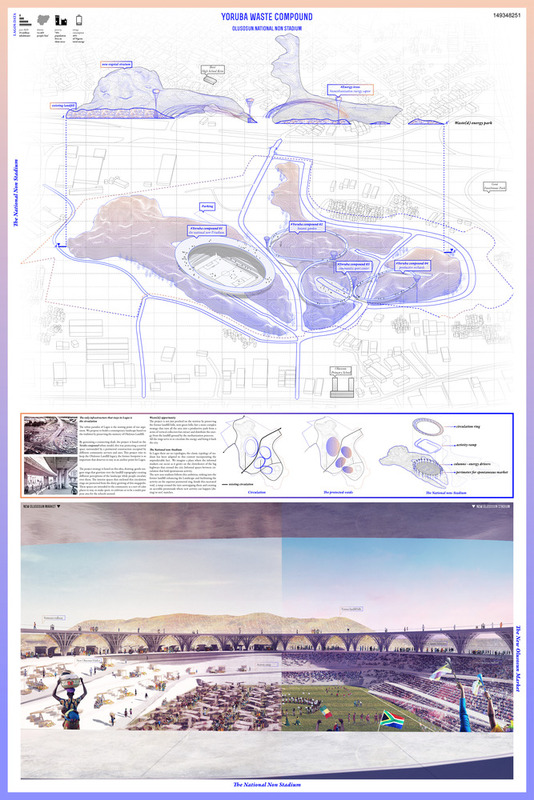 Architecture research initiative “arch out loud” has announced the winners of their “Waste: Multi-Purpose Stadium” competition, asking participants to speculate on the design of a multi-purpose stadium at the former Olusosun Landfill in Lagos, Nigeria. The megalopolis of Lagos, Nigeria has, since 1992, exporting its waste to the 100-acre Olusosun landfill. As the city grew from 7 million to 21 million, the once-distant landfill has now been enveloped by the city, causing it to be shut down in 2018. With plans to redevelop the area as urban green space and public park, arch out loud challenged designers to submit their vision for a scheme which incorporates new attitudes to waste, and redefines how the stadium typology can serve surrounding communities. WASTE (competition) may turn out to make its biggest contribution to the field by bringing together a set of documents that reveal how architecture is being shaped by and is responding to ecological thinking at the present moment. A preference for infrastructure over typology, landform over building form and systems over objects was evident throughout. Many projects also reflect a broad reconceptualization of building materials in relation to resources as opposed only to structural attributes. 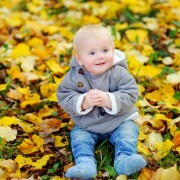 Below, we have republished the winning entry and three runners up. 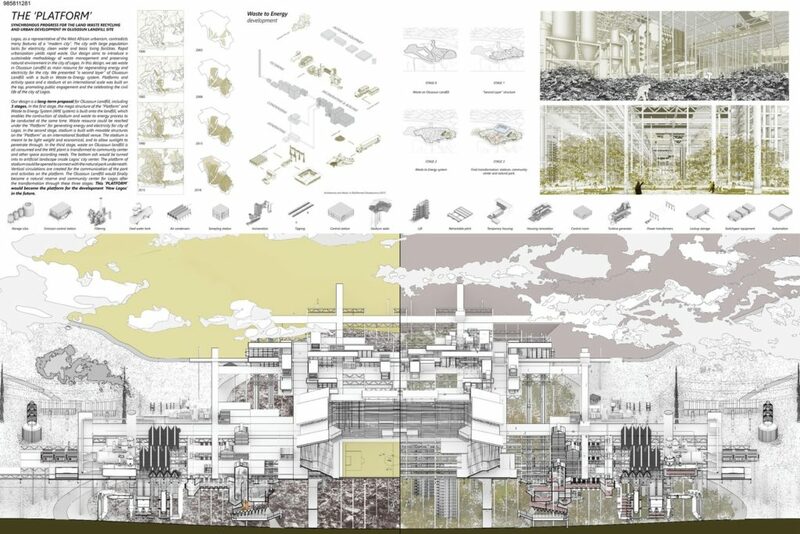 Recent arch out loud competitions have included the question “What is the future of HOME?” and ideas for the residential development of one of the last remaining sections of the undeveloped Mumbai coastline. Details on past and upcoming competitions can be found on the initiative’s website here. Description: The stadium is the natural meeting place for the neighborhood: an evolutive, flexible and transformable infinite bamboo based-unit structure. The bamboo seeded on the site becomes the local building material. A mix of social spaces, dedicated to enjoying the sport on game days, as well as dwellings and local public programs, to be occupied all year by the local community, blend together in the small-scale system. The aggregation can grow in each direction to meet all needs of various situations, with a potential multiplication at the scale of the neighborhood or city. Description: The urban paradox of Lagos is the starting point of our argument. 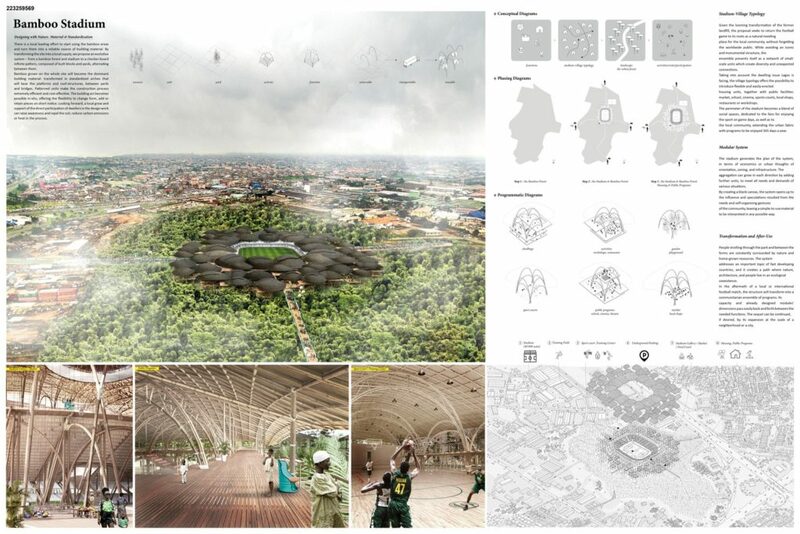 The project is based on the Yoruba compound urban model; a central space protected by a peripheral circulation. In Lagos, there are no typologies. The new non-stadium sinks into the former landfill enhancing the Landscape and facilitating the activity on the superior ring. Inside this excavated void, a ramp crossed the tiers unwrapping them and creating an accessible promenade where new activity happens. A place where informal markets can occur as it grows on the cloverleaves of the big highways. Informal spaces between circulation that held spontaneous activity. Description: A long-term proposal for Olusosun Landfill, including 3 stages. In the first stage, the megastructure of the “Platform” and Waste to Energy System (WtE system) is built onto the landfill, which enables the construction of the stadium and waste-to-energy process to be conducted at the same time. 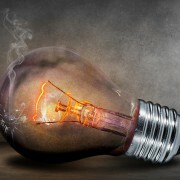 The waste resource could be reached under the “Platform” for generating energy and electricity for the city of Lagos. In the second stage, the stadium is built with movable structures on the “Platform” as an international football venue. The stadium is meant to be lightweight and economical, and allow sunlight to penetrate through. In the third stage, waste on Olusosun landfill is all consumed and the WtE plant is transformed to a community center and other space according to needs. Description: In Lagos, people live close to garbage dumps, which immerse the city in deeper problems of ecology and pollution, moreover Lagos is the largest importer of dangerous garbage. Recycle Cooperative Workshop – is a membership-based association of people created to achieve common economic and social goals that meet the needs of Lagos. 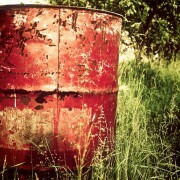 The main idea of the project – garbage is a resource. It works as a hub for the production of items made of recycled waste. 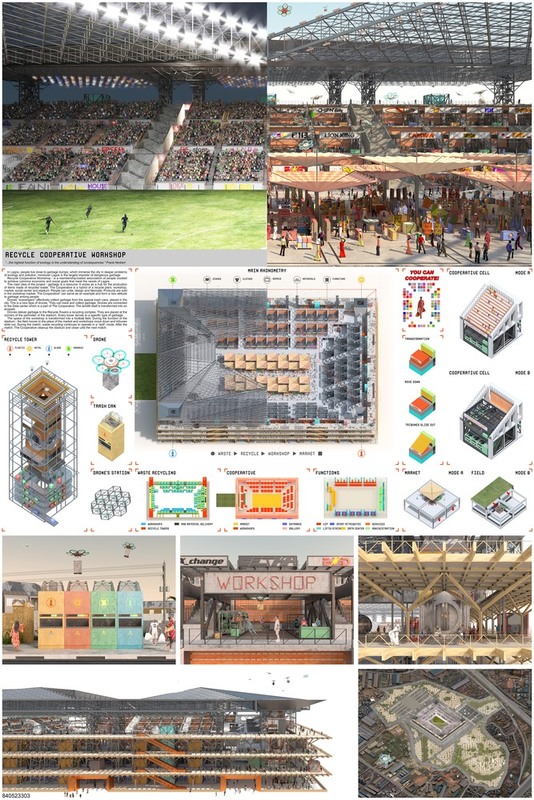 The Cooperative is a hybrid of a recycling plant, workshop, market, social center, and stadium. People can unite, design and fabricate. Products are sold in the workshop market. 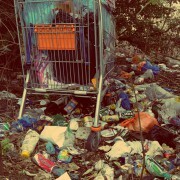 The Cooperative can serve as an example and form a new attitude towards garbage among people. Read the full article at Arch Daily here.